A: 20+ years. I started with an electric guitar when I was about 8, but I didn't take the instrument that seriously until I was 12-13 when I bought an acoustic guitar. Q: What Camera/Microphones do you use? A: I used to film all my YouTube videos with just an iPhone until 2019 when I upgraded to a Sony A7III camera with a 16-35mm lens. For audio I record with a pair of Rode NT5 microphones with a Rode NTK Tube Condenser Microphone. Q: Why don't you show your face in your videos? Q: What breed of dog is Maple? A: My loyal sidekick Maple is a mixed breed with part Border Collie, Golden Retriever and Shetland Sheepdog. Q: How does Maple play instruments? Q: What makes the strings wobble sometimes in your videos? A: The iPhone's camera uses a Rolling Shutter which doesn't capture the entire frame instantaneously and the bright light of the sun affects the shutter lens speed which allows for the strings played at certain frequencies to appear as oscillations. 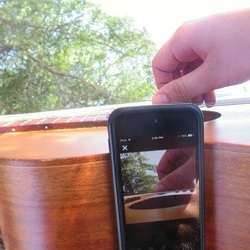 Record a guitar with an iPhone outside on a sunny day and the strings will wobble! Q: How did you learn to play the guitar/other instruments? A: Aside from a few basic guitar/piano lessons I'm self taught with all the instruments I play. I learned to read sheet music and would spend hours every day sight reading anything I could find online. Learning a lot of classical/flamenco music helped develop my Fingerstyle guitar techniques. Q: What guitars do you play? I mostly use four different guitars in my videos, a Cordoba C9 Classical Guitar, Baden A-Style with Martin Steel Light/Medium Phosphor Bronze Strings, a Martin DM model with Extra Heavy Gauge Bronze strings, an Alvarez Dreadnought which I have strung with Ernie Ball Nylon strings, and my Alvarez ABT60 Baritone Acoustic Guitar. Q: How many instruments do you play? I play the Acoustic, Electric and Classical Guitar, Harp, Piano, Drums, Harmonica, Accordion, Banjo, Ukulele, Mandolin, Glockenspiel, Kalimba, Violin and Cello. Q: How do you come up with your arrangements? A: I mostly figure out my arrangements by ear. I try to capture the essence of the song as best I can, playing the vocal melody, bassline, rhythm and any other key parts simultaneously. It's a fun challenge figuring out how to play a song on a single instrument. Q: Where can I find more of your music? A: I post full songs to YouTube.com/AcousticTrench, and you can find my music on Spotify.